You just got a new North American toll free phone number. It has an unlimited North American long distance plan. When someone calls, it hunts for you in a manner that you define. First it rings your iPhone, then your Blackberry, then your anachronistic landline, then your computer. If it can’t find you, you can tell it to look for someone else, like your assistant or partner. If it can’t find anyone in the end, it takes a voicemail message and emails it to you. It offers all those annoying “PBX” services that the big companies use: press 1 for this, press 2 for that, etc, so you can integrate it into a multi-user environment and look all big business (assuming you aren’t to begin with). In other words, it does everything you’ve ever heard that a telephone service can do, and then some. And it costs you $15 a month. A dream? Well, yeah, but not yours. It’s actually the dream of quality, easy-to-use voice-over-the-internet finally realized. I was managing my calendar on my iPad last night and something was bothering me about the experience. Every time I deleted a repeating event, I found myself pausing in thought, losing trust in my instinctive nature. Managing my calendar is something I do naturally in iCal on my Mac, and it’s a very natural process. So I took a moment to examine the process on my iPad to see what might be tripping me up. I was surprised to find that it was Apple’s poor sentence structure. Do you see what tripped me up? It’s Apple’s funky grammar and sentence structure, regarding the word only. The use of the word only in different positions of the sentence is confusing, not only for a user like me who uses both the Mac OS and the iPhone OS, but also for anyone using iPhone OS to delete repeating events. On the Mac, the sentence is: “Delete Only This Event”. 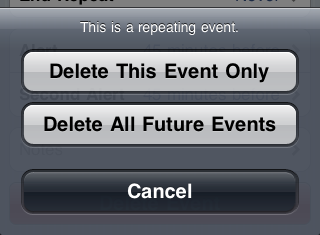 On the iPad and iPhone, it is: “Delete This Event Only”. In iCal on the Mac, only is used an adverb, so it is modifying the action the user is taking. (Or that’s how I read it. I’m no grammar king, so I could be off in my technical specifications there. Feel free to correct me if I’m wrong) Whether adverb or not, however, the fact that only comes early in the phrase is primarily important to communicating the meaning of the button’s action clearly. On the iPhone and iPad, Apple turns only into an adjective (again, I could be wrong on my grammatical specifications, but that’s my take). Only now modifies the sentence’s subject, rather than the action. Not only that, but the word falls off the end of the sentence and could be ignored. And that was my problem. I was reading just “Delete This Event”, which is a full sentence and represents what I was essentially trying to do (delete one event in a collection of repeating events) and ignoring the modifier that hung off the tail end: only. I think Apple’s got the phrasing wrong on the iPad and iPhone. The correct sentence structure to communicate the meaning to the user is, “Delete Only This Event”. The element of modification occurs early in the sentence and is immediately communicated. 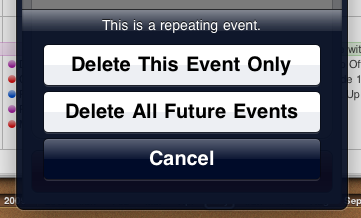 “Delete This Event Only” is, imho, not only bad grammar, but bad user interface design. I had this funny feeling something like this would happen. Apple has announced that the iPad won’t be coming to Canada until the end of May. This means, in realistic terms, early June. It was so worth that trip to Seattle. The iPad is my new best friend. My dad piloted our rental vehicle southbound through a windstorm and into a vast landscape of Americana: deluxe roadside rest areas, never-ending used car lots, enormous neon signs, epic-sized malls and their requisitely epic parking lots. Forget Texas, everything in America is big, period. 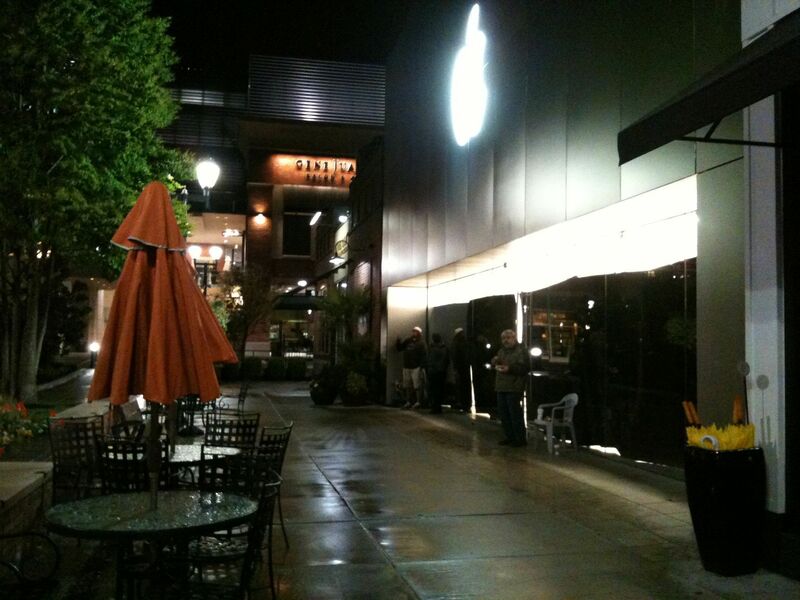 It wasn’t long before we reached our destination: the Apple Store at University Square, an open-air mall of highbrow retailers in Seattle. Staying up all night with a handful of other faithful Apple geeks was an uncomfortably cold and tiring part of the total positive iPad purchasing experience. I plan to write about it in more detail for my Yukon News column this week, but in the meantime lean a bit on some more mainstream press for a view of the experience. Cult of Mac has declared our cozy little iPad line the “largest and most ruckus…in the world” (Video: iPad Receives Ruckus Welcome At The Seattle Apple Store). That comes as some surprise to me since that long, dark night was awfully quiet and dull save for the humorously incestuous Chatroulette sessions staged by a couple of Vancouver geeks. Anyway, here’s a peek at our line through the eyes of some dude from Cult of Mac. Oddly enough, the Cult of Mac video doesn’t even catch the University Square line up at its peak. I snagged this panorama just as we left and it shows the trail of people snaking much longer–and this is about an hour after the store opened. Duh… maybe that’s because no side is up anymore…? If you’re going to be senselessly critical, at least be logical about it. From A whole new iD. For better or worse, Apple, has set a sort of Gold Standard for iPad apps by pricing their various iWork apps at $10 a piece. That makes a decent utility like Things seem ridiculously overpriced at $20 and OmniGraffle disastrously inflated at $50. I was comfortable laying out $10 for Pages and this purchase set the standard for my expectations of the prices of other apps. As a result, $8 for Autodesk’s excellent Sketchbook was just right, but $10 for Brushes was too much. A sketching app provides less functionality and usefulness than a full-powered word processing app, and should be priced suitably. From this perspective, the general-purpose task management utility Things is priced too high, especially when you consider that potential early adopters of this app have probably already shelled out $60 for the desktop version, and $10 for the iPhone version (and I thought I was being extremely generous paying that much for the iPhone version). Things should be priced under Pages, at about $8. Then there’s Omnigraffle. I’m an Omnigraffle devotee from way back, and I adore the app on my Mac. It’s primary tool for my day-to-day work as an information architect and designer. But $50 for the iPad version, in light of the iWork golden mean, seems ridiculous. Of course the argument is obviously that Omnigraffle is a premium app designed for a professional niche. But speaking as a member of that demographic, I still find it overpriced. iWork is a $80 desktop suite. If you average the price of each app therein to about $27, then the $10 price of the iPad app is just over 1/3 of that price. In comparison, Omnigraffle’s $50 iPad price tag is exactly half the cost of it’s desktop counterpart. Omnigraffle’s pricing should have followed the Apple pricing pattern and been offered for about $30. I would purchase it at that point almost without question, assuming the unique functional and utility qualities were there, and they seem to be. The platform-heavy $50 price tag for Omnigraffle on the iPad encourages me to just stick with the product on my Mac; I’m not compelled to invest in it at $50 (especially when there’s not even trial version to sell me on the product). But this whole discussion simply points to the fact that the iPad app economy is (obviously) young and in a state of flux. No one really, fully comprehends the value of the iPad yet, and therefore it’s tough to extrapolate what the true general value of any app on the platform is. The prevailing mentality seems governed by two things: the iPad is bigger than an iPhone, and smaller than a notebook. Therefore pricing and utility value also fall into that fuzzy middle zone. At lot of the value system in the iPad app store will depends on Apple’s successful positioning of the iPad itself in peoples’ minds, something it hasn’t done very well yet (observe Letterman’s Top Ten list). Only when we all agree on what the iPad is can we agree on what an iPad app is worth. But in the current climate, I call Things and Omnigraffle overpriced. We made it here. I’m first in line on the pre-order side of the door, a local guy is first on the no-pre-order side, and my dad is second over there (if he decides to buy one).